Being a teenager is hard. Being a Christian teenager can be even harder. At Southminster, we foster an environment to support each of our youth as they grow as individuals and disciples. We make sure to have lots of fun along the way though and to create lifelong friendships with each other. Is the Bible true? How can God be “three-in-one”? If there is only one God, why are there so many different religions? Is it okay to be angry at God? These are just some of the questions we tackle in our youth Sunday School every week. Students in grades 5-12 meet every Sunday at 10:00 a.m. until 10:45 a.m. This is a time for youth to come together to grow in their faith, ask questions, and share fellowship from each other. This safe, welcoming environment allows students to dive deeper into their faith and develop stronger friendships with fellow students. We invite you to sign up to be a part of Southminster’s Youth Group, and join in a year of fun and God-centered learning. 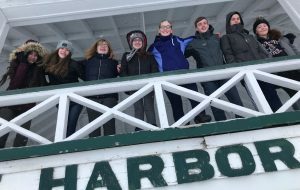 The 2019 winter youth retreat up to Lake Geneva’s Covenant Harbor Retreat Center was an awesome trip filled with snow tubing, broom ball on the lake, snow ball fights. The youth also enjoyed faith sharing and a concert. Any and all youth are invited to join the fun next year. For more information about Southminster’s Youth MInistry, email Kari@spcah.org. 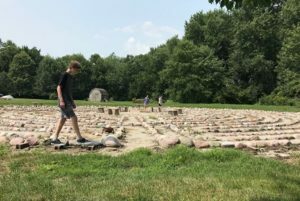 On August 12, the youth traveled to Earth Wisdom Labyrinth in Elgin, the largest outdoor labyrinth in Illinois. It was a hot day, but we really enjoyed our picnic under the tree and the labyrinth surrounded by forest, prairie plants, and cornfields. It was a beautiful, spiritual, and enlightening day! 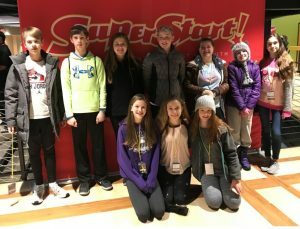 Our Middle schoolers attended SuperStart, the nation’s largest Christian youth event, on April 13 and 14. SuperStart is “a high-energy weekend event in which youth can learn and grow in their relationships with friends, leaders, and most importantly, God.” We had fun enjoying awesome worship music, Christian lessons, a video game contest, and even some gravity ropes and laser tag! 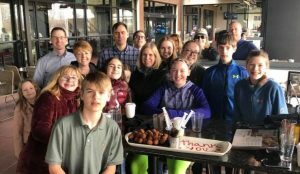 On April 8, our youth ventured out to Top Golf and had a great time! All youth are invited to join us on our next outing. Email Kari@spcah.org for upcoming events. Southminster hosts a number of events for youth outside of Sunday School. Typically, we meet once a month to have a game night, do a service activity, watch a movie together, or go on an outing somewhere like extreme trampolining or to Fright Fest at Great America! We also participate in retreats during the school year. Some of our summer mission trips have included traveling to Harlem in New York City or to Mission, South Dakota to work on a Native American reservation. Southminster offers confirmation for eighth grade students or students who haven’t yet been confirmed but who would like to be. In addition to classes specifically designed to prepare them for the next step in their faith journey, students attend a retreat, participate in service activities, write a statement of faith, and then join the church where they are welcomed before the congregation.